In the hot summer of 2018, our reporting team at Hungary’s Atlatszo tracked two luxury vehicles – a private plane and a luxury yacht – that the Hungarian government elite, including Prime Minister Viktor Orbán and his closest allies, used to travel to business meetings, football games and vacations abroad. We found out where these expensive vehicles were registered, gathered and visualized tracking data on their previous routes and managed to take photos of members of the government, business tycoons and public officials closely tied to the governing Fidesz party board them. Both the jet and the yacht were frequently hosting politicians, businessmen and public officials close to the governing party, including Prime Minister Viktor Orbán. After the story was published last year, causing public outrage in Hungary, pro-government pundits and media outlets questioned our reporting and suggested that we used illicit methods. Some went as far as suggesting that a foreign intelligence agency was behind our findings. But we used open-source data and resources available to anyone on the internet to track the vehicles and take pictures and drone footage of the passengers on board. It took “only” lots of work, dedication, patience and money to investigate our story involving the private jet worth 17 billion Hungarian forints (US$59.5 million) and the yacht worth around 7 billion Hungarian forints (US$23.5 million). Both the jet and the yacht were frequently hosting politicians, businessmen and public officials close to the governing party, including Orbán, who used the jet to fly to Bulgaria to watch the Videoton-Ludogorec soccer game. If someone is super-rich, they are usually not satisfied with owning status symbols — they also want to show them off. They want to prove their wealth with expensive watches, cars, luxury villas, private jets and yachts. This isn’t something uniquely Hungarian; the extremely wealthy do this everywhere. The wealth of the people connected with the Hungarian government has been widely reported in Hungary. For example, a childhood friend of Viktor Orbán, Lőrinc Mészáros, amassed wealth estimated to be 280 billion Hungarian forints (approximately US$1 billion) since 2010, when Fidesz came to power. What we managed to do is to show it in a way that is easy to understand for everyone. The internet is full of sites, available to anyone, where yacht and plane spotters upload their footage to boast about their sightings. Our work was made much easier by the yacht- and plane-spotter community. Thanks to sailing and aviation enthusiasts, there are several open-source websites available for anyone to track yachts and airplanes in real time and to access the archives of previous routes or flights, such as Vesselfinder, Marinetraffic, Radarbox24 and Planefinder. With a little knowledge of English, anyone can use these pages, although sometimes accessing the archived routes costs money. Some of the yacht and plane enthusiasts also regularly visit ports and airports to see yachts arrive or planes take off and land. Many of them also take photos and videos of the yachts and airplanes. The internet is full of sites, available to anyone, where yacht and plane spotters upload their footage to boast about their sightings. It was spring 2018 when we were first tipped off by a plane spotter that a private Bombardier jet with the registration code of OE-LEM had appeared regularly at Budapest’s airport, at the terminal used by private jets. A quick Google search revealed how expensive it was, so it was immediately clear that only somebody with considerable wealth would be using it. From that day we followed the plane’s flights and sent photographers to the Budapest airport arrivals to take pictures of the passengers it was carrying. Even its call sign, beginning with OE, is special. The letters “OE” indicate that it was registered in Austria. The database of the Austrian aviation authority is easy to search, and by searching for the OE-LEM call sign we found that the jet was operated by the Austrian company International Jet Management GmbH. This was suspicious in itself; the airplane, when not in flight, was always in storage at the Budapest airport. Moreover, the Austrian aviation authority does not release the owners of aircraft, only the company that operates it. This is very useful for someone trying to own and operate a jet in secrecy. Another breakthrough came in July 2018 when a Hungarian website published a photo of Lőrinc Mészáros, a billionaire businessman and a close friend of Orbán, on the deck of a luxury yacht called Lady Mrd on the Adriatic. From that day on we tracked not only the plane, but also the yacht, and started researching the vessel. It turned out to host not only Mészáros but a bunch of other prominent Hungarian business tycoons and public officials as well during the summer of 2018. The movement of yachts can also be tracked on websites that show the location of the vessels in real time. These sites include brand, model, size and previous voyages of the ships; even photos supplied by spotters are available. This is how we found out that the original name of the yacht was Lady M, previously registered in the Cayman Islands and later transferred to the Maltese registry. To determine ownership, we sent requests to the Investigative Dashboard and consulted the ICIJ offshore leaks database, as well as asking a Maltese journalist to dig into the local ship registry. The owner of the ship turned out to be a Maltese company called L&L Charter Ltd., which is in turn owned by a Maltese company specializing in being a proxy for other companies: It manages more than 200 offshore companies. While we were tracking the routes of OE-LEM and Lady Mrd during the summer, we found multiple points of contact between the two – that is, they often traveled to the same place at the same time. So we decided to look into their previous routes to see if they had “met” earlier. However, most of the plane- and vessel-tracking sites ask you to pay for using their archives – this is how they make money. This means that Atlatszo needed to pay for the information. But it was worth it. We received previous “port calls” of Lady Mrd and accessed archive flight routes of OE-LEM. Now let’s get to how we managed to get pictures of people on the vehicles. Both aircraft and ships have to announce their destination when they take off or leave a port. This means that every time OE-LEM took off, or Lady Mrd left the port, we already knew their destination. In such cases we asked a photographer colleague to go to the destination and wait for the vehicle’s arrival either at Budapest’s airport or the Adriatic coast in Croatia. This is how photographs were taken and the drone footage was made. The Lady Mrd on the Adriatic Sea near Opatija, Croatia on August 16, 2018. We also have video footage of Lady Mrd and her guests arriving in the port of Rijeka; this was another reason why some pro-government pundits accused us of being agents of “three-letter agencies.” But a simple Google search reveals that there is a live online camera stream of the port of Rijeka available for anyone to watch. It was here that we could watch the Lady Mrd as it departed near the live cameras. We simply recorded the camera’s footage on our laptop screen as the ship was arriving and as guests arrived in black minivans. Obviously, capturing them wasn’t purely accidental. We were constantly watching the live stream from Rijeka, and we knew when the jet OE-LEM landed in Rijeka. When we saw that the ship’s crew started to move around the yacht to get ready for the guests’ arrival, we pushed the record button. One of our reporters was working with two laptops simultaneously during this time. On one laptop, she was writing emails and articles and doing her regular work. On the other screen, she was watching the live stream from the port and regularly checking the luxury jet’s position. The Lady Mrd in the port of Rijeka, Croatia on August 20, 2018. At the end of August 2018, we started to visualize the routes and meeting points of the two luxury vehicles. 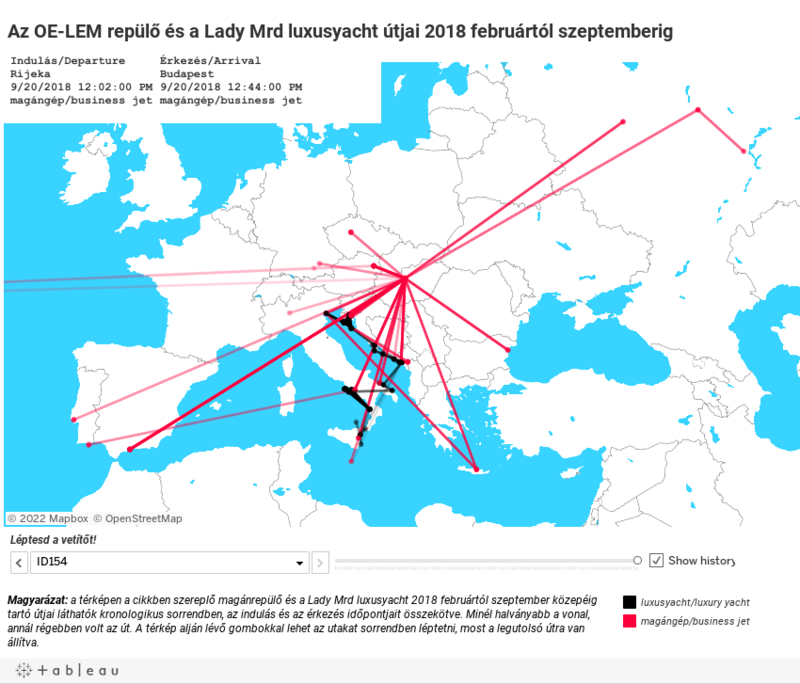 We prepared a spreadsheet with the times and locations of the departures and arrivals for the vehicles, and then we created the maps and data visualizations that show very clearly how OE-LEM and Lady Mrd met several times during the summer. Initially, we only had the departure and arrival dates and the names of the departure and arrival cities. To create the maps, we had to figure out the exact longitude and latitude of the positions, and had to ID the connected journeys in order to create connections on the maps. Even from the spreadsheet, it was clear that the two vehicles had multiple points of contact in the previous six months, but it became much easier to see the connections on a map. The pattern was clear. The plane usually took off from Budapest or Vienna, with the destination of port towns near the location of the luxury yacht. These included Castellammare di Stabia (near Salerno), Porto dell’Etna (in Catania) and Calaponte (near Bari) in Italy; in Croatia, there’s the enchanting town of Rijeka, Pula, Opatija, the ports of Krk island, the magical Dubrovnik and Cavtat; in Montenegro, there’s Podgorica, Tivat, Kotor and Herceg Novi. There were multiple challenges in creating the maps. We found that the primary consideration was clarity, so we created maps using Mapbox software which does not display terrain — only country borders. The colors were assigned in accordance with the main colors of Atlatszo (red, black, blue and white). At the same time, we had to display the routes of 154 points of entry and departures. We chose to connect the points in accordance to concrete routes (1 starting point, 1 destination = 1 ID), and on the other hand, we stuck to the chronology of the events, in order to be able to follow the routes through time. To make our work more transparent, we published the map as well as the database behind it. The article summarizing the findings of the three-month investigation was finally published at the end of September 2018 and stirred public controversy immediately. While the government does not respond to Atlatszo articles, this time even the prime minister reacted with threats. After that, the government propaganda machine, including multiple government-aligned media outlets, hit us hard with headlines like: “George Soros is using unmanned aircraft to have people close to the government watched.” On the other hand, the article received multiple journalism prizes. Atlatszo journalists were awarded the Prize for Quality Journalism and the Transparency-Soma Prize for Investigative Journalism for their work on this project. Katalin Erdélyi is an investigative journalist at Atlatszo, an investigative journalism nonprofit based in Budapest. Erdélyi started her journalism career at the Thick Skin public watchdog blog, and has worked with Atlatszo since 2012, where she has specialized in political corruption and public procurement in Hungary. Attila Bátorfy is a data journalist and head of the data journalism team at Atlatszo. Bátorfy is the former editor of Kreatív magazine and Vs.hu. He founded Databánya, a blog and community on data journalism and visualization. Bátorfy also teaches courses on data journalism. Tamás Bodoky is a co-founder, editor and director of Atlatszo. Bodoky is a former journalist of Magyar Narancs weekly and a former editor of Index.hu, a leading Hungarian news site. Bodoky won multiple investigative journalism awards before starting Atlatszo in 2011.